I hadn’t heard of the new movie “True Grit” until my friend Mike called me up to go to the theater a few days ago. Because I was vehemently uninterested in seeing “Tron”, the Coen brothers’ new movie seemed like a good alternative after glimpsing descriptions of shows playing in local theaters. I saw “True Grit” that evening, and I can’t wait to watch it again while it’s playing on the big screen. The movie was fantastic. I hadn’t heard of the original “True Grit” with John Wayne, nor had I read the novel by Charles Portis on which both movies were based, but I think I appreciated the movie more for having known nothing about it beforehand. If you haven’t seen “True Grit” in theaters yet, I recommend you don’t read the rest of this article. Stanley Fish of the New York Times has a high-quality article about the religious undertones that he perceives throughout the new “True Grit”. His point is that this movie avoids creating a two-dimensional picture of reality. This is what makes it different from (and perhaps better than) the John Wayne version. Protagonists suffer alongside antagonists, and all display traditional heroic qualities. Reward and punishment for any kind of virtue or immorality, respectively, is not meted out in the way everyone expects; if you have lived virtuously, it is no guarantee that something unspeakably horrible won’t befall you in this world. 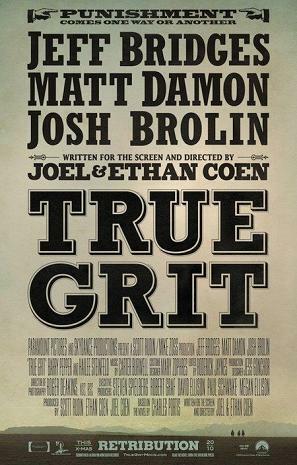 And yet “True Grit” is different from the Coen brothers’ earlier Western-style film, “No Country for Old Men”. That film was thoroughly depressing. Evil, in the form of the cattle-gun wielding character of Anton, stalks every good person, eventually destroys them all, and leaves nothing redeeming in its wake. “True Grit” has brighter moments. Fish argues that Mattie’s courage in seeing her mission through to avenge her father’s murder is a kind of religious virtue. The faith in one’s cause that continues to live on even despite great personal misfortune is the redemption in the world that “True Grit” creates. I agree with Fish – there is this beautiful quality about Mattie’s determination, her grit. But it reminded me less of a virtue out of the Bible, and more of the ideal of beauty polished to an awful splendor in the heroic world of The Iliad. While I was watching “True Grit”, it struck me that the basic story of Mattie Ross is very similar to the ordeal of Achilles in Homer’s epic. Both narratives revolve around the unquenched rage of each protagonist. Achilles is furious that his female war-prize is taken away from him by the commander of the Greeks, Agamemnon. He goes on to lash out on all around him, friend and foe alike, in a glorious spectacle of ego and warfare as he tries to preserve and expand his immortal honor. Mattie is also driven by anger and for perhaps a better reason than Achilles because her father (rather than a concubine) has been taken away from her. Up until the end of the movie, she never acts like a typical 14-year-old girl. Her world-wise ways and unyielding mission to personally destroy her father’s murderer makes her almost larger than life, like Achilles. Both of these works of art reiterate the theme that rage can drive us to acts of awful heroism. But fury is not the only thing that Achilles and Mattie have in common. There is a kind of softness to the story of “True Grit”, which is also there in Homer’s marble world of gods and heroes. And it comes when rage runs its course. Both Achilles and Mattie don’t just want to harm the people that have caused them pain. Even killing them would not be satisfactory. Achilles drags the body of the defeated Prince Hector across the beach of Troy as a punishment for slaying his beloved comrade Patroclus in battle. Hector’s immortal honor must be stained by the mud. Similarly, when the Texas Ranger La Boeuf offers to capture the murderer of Mattie’s father and bring him to justice in another state, Mattie refuses the offer because she wants to deliver the stroke of death to the man herself. It is only in the very last chapter of The Iliad that the rage of Achilles subsides. Sneaking through enemy lines, the Trojan king Priam finds the tent of Achilles and begs for the body of his son, Hector, back. The aged monarch goes on his knees before the warrior Achilles and pleads for mercy and decency. Priam touches the hands of him who killed his son. And the great anger of Achilles fades. Not because Achilles is one to offer mercy (he killed supplicants in battle before). Not because he is convinced by Priam’s arguments (Achilles showed no prior respect for the rites of the dead). And not because his anger is satisfied at the sight of the enemy king prostrate before him (Achilles takes no delight in the moment). The quivering fury abates because for the first time in the story, Achilles sees a role for himself other than immortal hero. Clutching at his hands, Priam reminds Achilles of his own father, who had died long ago. Achilles sees himself, for the first time in many years, as a son, someone who owes someone else – a father – respect. Likewise Hector, the enemy Achilles had slain and whose body he dragged in the mud, Prince Hector, becomes in that moment his brother. Achilles gives the body of Hector back to Priam and lets him carry it back to Troy for proper burial. This is not the first reference to snakes in the movie – they are a recurrent symbol of the unavoidable dangers of life. They also illustrate the change in the relationship between Mattie and U.S. Marshall “Rooster” Cogburn, whom she commissions to hunt down her father’s murderer, Tom Chaney. When they first hit the trail, Rooster stretches a rope around himself at night to ward off snakes. Mattie wants to do the same, but Rooster tells her that she has nothing to fear from snakes because she’s too small for them to bother. Mattie trusts Rooster and doesn’t use the rope. One evening later in the film, when Rooster gives up on the quest for Chaney, Mattie steals the rope from him and surrounds her sleeping bag with it. This signifies her losing trust in Rooster – she is facing the perils of the world entirely on her own again. The scene where Mattie kills Tom Chaney is not really the climax of the movie, it seems to me, just like the duel between Hector and Achilles is not quite the centerpiece of The Iliad. The really beautiful part of “True Grit” is what happens afterwards, when Mattie falls into the snake pit, gets bitten, and is pulled out by Rooster. The grizzled, gritty U.S. Marshall “Rooster” Cogburn, who had avoided Mattie like a pest while she endeavored to recruit him to hunt Chaney and then, having been convinced to join the effort, chaffed at Mattie’s independent spirit, now cradles Mattie in his arms as she grows faint from snake poison. They ride together on Mattie’s pony, Little Blackie, past the dead bodies of the outlaws that Rooster had slain and into the prairie to seek medical care for Mattie. After hours of exhausting travel, Mattie, for the first time in the movie, is ready to give up and die. This time, Rooster is the one who insists on pressing onwards. In what I am certain is a reference to Robert Frost’s poem “Stopping by the Woods on a Snowy Evening” (given the nighttime, the horse, and the specter of death in the scene), Rooster whispers to Mattie that they “have miles yet” to go. Beneath the moon and stars, Mattie and Rooster ride through the prairie (which looks perfectly fake in the movie) until their pony, Little Blackie, stumbles then collapses underneath them from exhaustion. The pony whimpers but is now a liability, and Rooster unflinchingly shoots it in the head. And for the first time in the movie, Mattie cries. Not after her father died, not in the wilderness, not when she was captured by Tom Chaney did Mattie cry. She was too full of fury to have any feeling. But Little Blackie the pony was an independent spirit, like her, a little creature plunged into a helpless existence in a cruel world, like Mattie. Death found Little Blackie before her time, like it had found Mattie’s father. Mattie cries because she feels the death of Little Blackie as if it was almost her own death. But Mattie does not die; she is saved by Rooster, in whom Mattie had earlier lost faith. The movie is deceptive in portraying Mattie’s character development; we are shown nothing of her early life. Mattie is not a force of nature tasked with avenging a murder, as we are led to believe. She is a 14-year old girl who has lost her father. Fighting the snake venom seeping through her body, Mattie allows herself to be weak. She wails loudly under the dark prairie sky. Squirming in the arms of Rooster, she becomes a daughter again, as Achilles becomes a son of the supplicant Priam. I think the philosophical thesis, if any, of the movie “True Grit” is this: yes, the world is a place where misery and destruction lurk for both good and bad people alike, but there is beauty in the rare times when people really stick their necks out for one another. 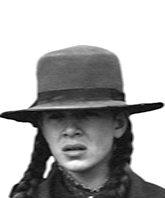 Stanley Fish is right in calling “True Grit” a religious movie, but I think that its pious qualities lie beyond Mattie’s convictions in the righteousness of her cause. In this, she displays more of an Achillean courage born of rage. There are, of course, differences between the two characters. Mattie is no aristocrat like Achilles, which automatically disqualifies her from being a true Homeric hero. Nor does she indiscriminately kill all that come in the path of her anger, as was Achilles’ wont. And nobody really saved Achilles from death as Rooster had rescued Mattie. But the stories of Mattie and Achilles have in common the taming of their rage. For Achilles, it was through his mercy towards Priam. For Mattie, it was through Rooster’s mercy towards her. In an otherwise pitiless world, how we help one another is what really reveals the divine part of our natures. God is the refuge, as the hymn suggests, but Mattie only comes to know the “everlasting arms” when she is dying in the hurrying embrace of Rooster and only comes to see her enemies destroyed as they race past the tribe of bandits Rooster had slain. hey buddy, great post. my fav. part is when you compare Mattie and Achilles. Interesting how you saw Robert Frost’s poem reference in the last scene. I also found that scene to be poetic but couldn’t quite put my finger on it. Thanks for pointing it out. Coen brothers sure know how to make movies. Also, check out King’s Speech. You’ll enjoy it because of the historical undertone and fine performances by Colin Firth, Helena Bonham Carter and Geoffery Rush. Thanks for the comments, guys. Yeah, I’ve been curious about the movie King’s Speech – upon your recommendation, I’ll go and see it.